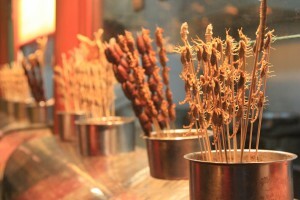 After exploring the Silk Market and dinner with new friends, we headed to Wangfujing on our first night in Beijing. 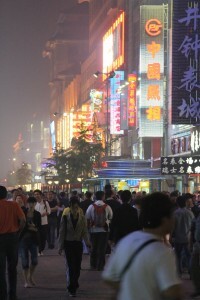 Wangfujing is a huge bustling market with all the latest brands and big retail stores. The street dates back to the Ming Dynasty when a nearby well made it a desirable residence for Princes because of its sweet water. We passed on the sweet water and headed straight for the Wangfujing Snack Street an older, more crowded, side-street just off the main strip. 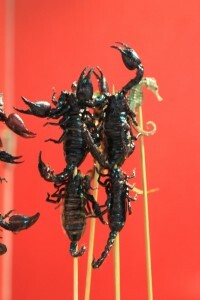 We were greeted by tiny scorpions wriggling in agony because they’d been skewered on a stick. They shared the same fate as starfish, larvae, beetles, millipedes, centipedes, big scorpions and seahorses — death by snacking. 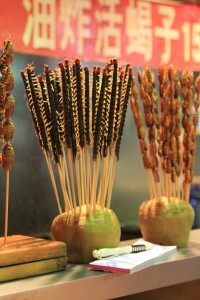 Of course, the street had all sorts of more normal snacking fair, but what’s the fun in writing about that. It was here that we also discovered Beijing’s New York inspired “I heart BJ” campaign. 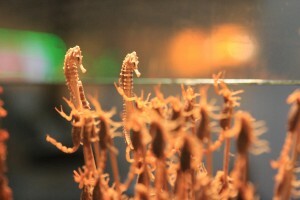 I felt saddest for the sea horses. Poor things. Bugs, meh.